Varsity girls won their first playoff game last night in Johnson City against Boerne. 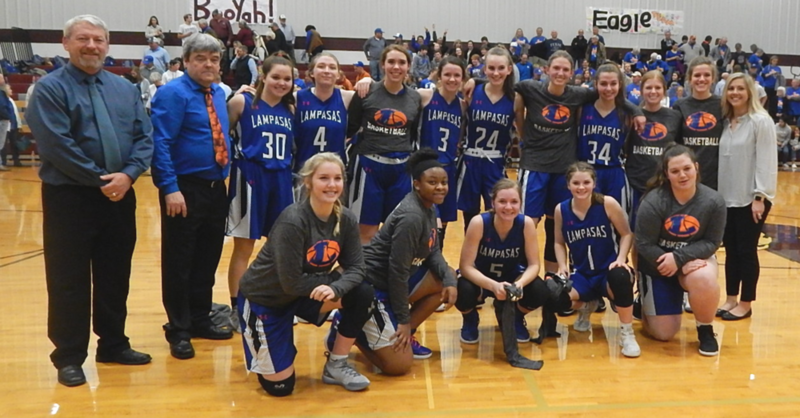 (51-30) It was an intense game, because both teams were competing to the best of their ability for the win, but the Boerne Greyhounds couldn’t outwork our Lady Badgers. The Badger team’s last game of the season will be tonight against Liberty Hill in Badger gym. Not only is it the last game of the Badger Boys season, but it will be the last time that the 2019 seniors will be playing on their home court. Game times for the boys are Freshman 5pm, JV 5pm, Varsity 6:30pm. Varsity Girls continue to remain undefeated in district. Rain and cold weather can’t even hold them back. Tonight, the girls will be going up against Burnet, who like them is a team to be reckon with. JV games will be starting at 4pm and Varsity at 5:30pm. Varsity Boys had a 5-1 win over Jarrell Friday night and will be using the energy from that win as they take on Burnet on tonight. JV will start at 4pm, Varsity at 7:30pm. Both the baseball and softball teams will be hitting the road tonight. Baseball is headed down to Brownwood for a friendly scrimmage, while softball goes to Roger to also play a scrimmage.